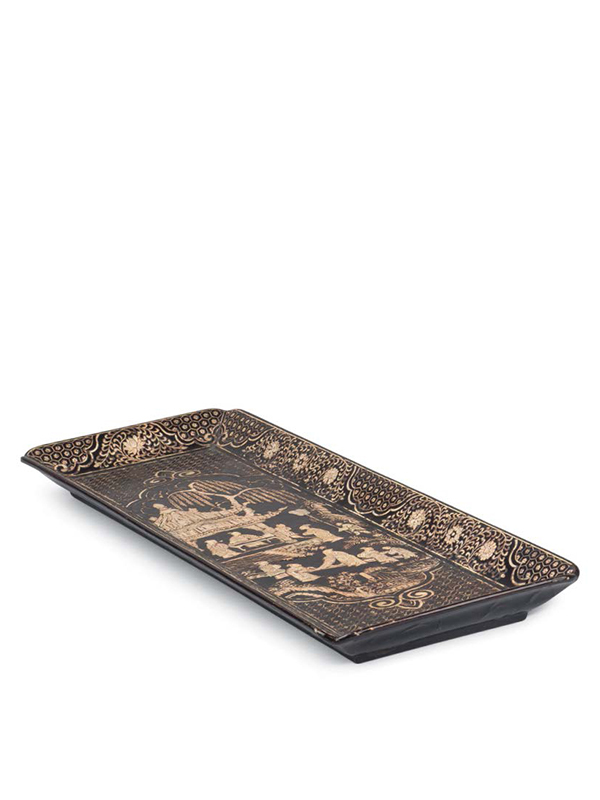 A rectangular lacquer tray inlaid in mother-of-pearl, with indented corners and slightly flared rims, supported on a short foot. The centre of the flat surface depicts scholars in a garden setting. In a tiled pavilion on the upper left under a willow tree, a seated figure plays a string instrument. 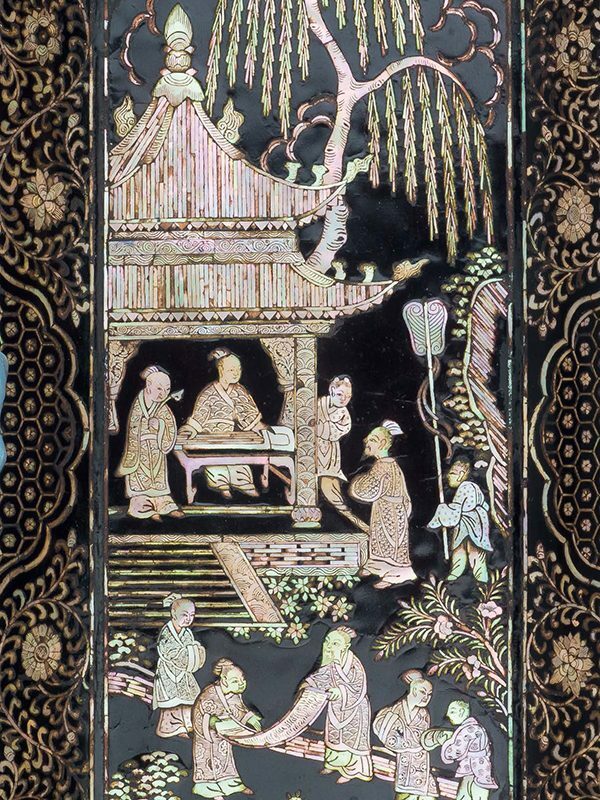 In front of the pavilion, a group of scholars examines a scroll painting. The scene is contained within a bracketed cartouche. The flared sides are decorated with scrolling flower blossoms amongst swirling tendrils, interspersed with shaped panels containing hexagonal diapers. The exterior is lacquered black. The tray is contained in a silver pouch and a Japanese wooden box. Furniture and daily utensils inlaid with mother-of-pearl were used by the upper classes of the Northern Song dynasty (960 – 1127). The technique became popular with ordinary people during the Yuan dynasty (1279 – 1368), and came to a crescendo during the Ming dynasty. Heavily influenced by jiehua, a kind of painting style with detailed architectural motifs, the design of Yuan to early Ming dynasty pieces appears with buildings as major elements and with figures playing a subordinate role. This type of rectangular tray with shallow sides was most possibly used for folded scrolls, as its name zhoupan (‘scroll tray’) suggests. Two examples dated earlier to the 14th century of the Yuan dynasty, decorated with a comparable hexagonal ground, are in the Tokugawa Art Museum. Two comparablenMing dynasty examples, both similar in the cartouche design and interlaced coin pattern, are in the Muwen Tang collection; one is especially comparable with the jiehua style design.3 Three further examples are dated between the 15th and 16th century: one similar in the cartouche design and depicting a dragon amongst waves is in the Klaus F. Naumann collection;  one depicting a landscape scene is in the collection of the Victoria and Albert Museum; one depicting figures in a landscape setting with a closely comparable floral scrolling design on the sides is in the Garner collection and was exhibited at the British Museum in 1973.